This week's challenge at High Hopes Stamps is #232: Polka Dot Mania! I used my brand new Robot with Balloon stamp to make this birthday card. I coloured this robot with my Crayola washable markers. These markers are not meant for artists but they work if you just want to test your watercolouring skills. The grey in the Crayola set has a brown tinge. I thought that patina suited the metal robot just fine! I adore this stamp. He's just so cute and perfect for men! High Hopes has some coordinating sentiments that work perfectly for their robot line up. I cut this stamp out on my new Brother Scan'N'Cut machine. I had to scan him a few times to get it to recognize him though, which seemed odd to me because his lines are clearly defined. I got it to work though and the outline is great. It didn't go between the antennae or the balloon string and the arm. I wouldn't have fussy cut between the antennae myself, but I would have done the arm. The narrowest point between the string and the arm is less than the outline I set (0.04"), which is why the machine didn't go up there. I think I could get it to cut a second shape inside there, but I'm just new to it for now. I'll play with it more later! I attended a 10-year-old boy's birthday picnic in the park the other day. I had to make a card super fast. When I need instant inspiration, I turn to sketches. 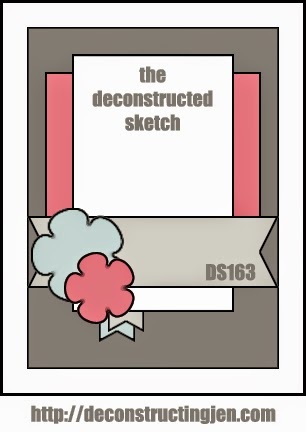 I made this card using the Deconstructed Sketch #163. I really like the Deconstructed Sketches because they strike a great balance between complexity and simplicity. I find a lot of challenges (especially colour ones) have too much going on. I find them overwhelming. Deconstructed Sketches, though, they have a great blend between interest and clarity. I think this image is so sweet. It's part of the Sweet November line from C.C. Designs. I coloured it with Copic markers. I swiped my grey ink pad over the sentiment strip to create that texture. I made this card lightning fast compared to my normal rumination and creation pace. The next day, I thought of the poem for the inside while on lunch at work. The day after that, the card went to the recipient! I used three colours of Copics: a base colour, a mid tone and a dark tone. The mid and dark tones I simply dotted over the image which I completely covered in the base tone (the lightest colour). I fussy cut around the bottom and tail so I could fit the sentiment underneath. I hope this card was enjoyed! Funny thing, the gift sort of went with it. It was completely unplanned this way but we got Grimlock, the Dinobot as the gift. Dragon, dinosaur, close enough! I've since made a few more with different dragon colours and papers. It was pretty simple!